News in overnight from Chris Chumley at Northrop & Johnson of a further $100,000 price cut on his central listing for sale, the 30.4m classic Burger motor yacht Ar-De. Ar-De was built for experienced owners and delivered in 1996 to a design by Don O'Keefe with worldwide cruising in mind. 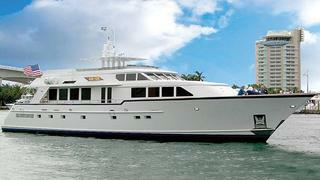 Accommodation is for six guests in a full-beam master suite plus a double and a twin cabin. All staterooms are en suite. She is an an open, uncluttered yacht with hideaway window shades, abundant enclosed storage and screens on all opening doors and ports. Butternut wood, carefully hand-finished with raised panels, is used for bulkheads and furniture to create a soft, rich interior. Twin 1,250hp Caterpillar engines give her a cruising speed of 17 knots and a range of 3,000 nautical miles. Located in Fort Lauderdale, Florida, Ar-De is now down from $2,795,000 to $2,695,000.